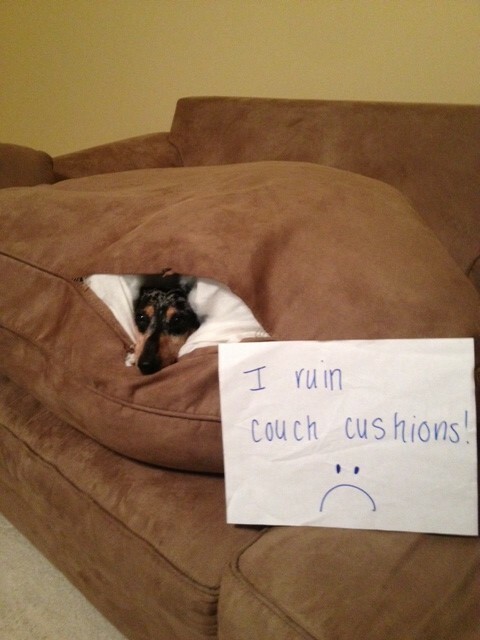 I can think of a lot worse ways for a dog could ruin the couch cushions! The pic made me laugh out loud. Only those of us with dogs would pick the dog over nice furniture!! A spotless house? Nah…..too lonely without them in the family! It’s a small price to pay to be comfy and cozy. So darn cute. Totally agree, 10x worth the cushion. It’s like he’s thinking “I know you like to sit on these but they make such great nests, right?” Bless. Totally! From this photo, it doesn’t even look like they need a new cushion, just sew it back up and turn it around if the seam is too visible! (Or better yet, add a zipper or velcro so they can open it back up when doggy wants to snuggle inside again! Ruined it?!?! It looks like he PERFECTED it to me!! Get your dog a Cozy Cave bed, he wants to play fort! aaah, what a cutie – it’s in a Dachsie’s genes – they HAVE to dig and burrow – I wd prefer a ruined cushion anytime to the angst and costs we had when our Tiggie got stuck in rabbit warrens in the forest – you know Nice sofa cushions are highly overrated!